Bruce Lee made four movies in the early seventies that left a permanent mark on the motion picture industry, and also on American culture. Lee’s astounding kung fu performances captured the imagination of an entire generation, and launched an enduring American fascination with Asian martial arts. 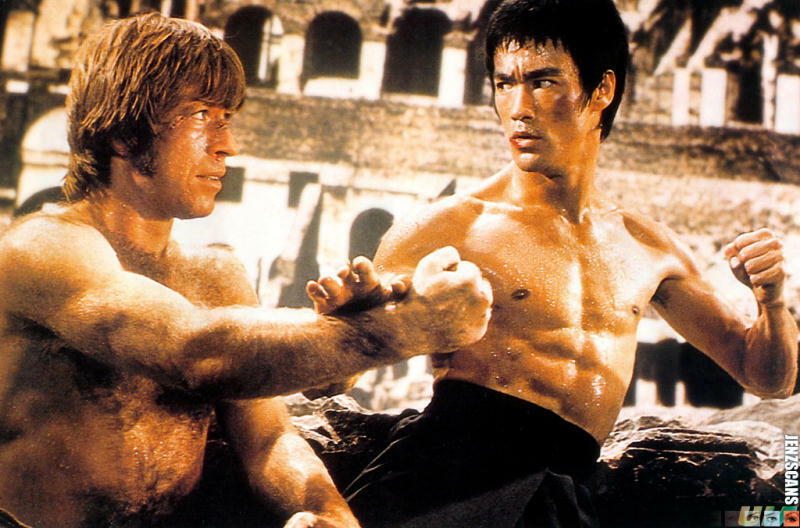 But Lee was not only a martial artist; he was also a trained actor. He began acting as a child, and by the time he was 18, he’d appeared in twenty films. As a teenager, when Lee wasn’t acting, he studied karate. It wasn’t long before his extraordinary fighting talent became apparent, and he started making movies that showcased his ability. These films gained rapid popularity in Asia, and became blockbusters when released in the US (to date, Enter the Dragon, his final movie, has grossed over $200 million). When Lee died in 1973 at age 32, the movie-going public, their appetite whetted by Lee’s great fight scenes, demanded more. Many Asian martial arts experts were recruited to fill the void. Some became quite successful in Asia, but only a few, most notably Jackie Chan, and later, Jet Li, made much of an impression on US filmgoers. Regardless, Norris was the first Caucasian black belt to gain popularity in the states, and he parlayed this into a long and lucrative career. His pathway to stardom was paved by actors he trained at his karate studio, including Steve McQueen, who urged Norris to take acting lessons. Norris did so, and went on to star in 20 films between 1977 and 1991. Though none were big hits, a few grossed over $20 million in the US, a respectable and profitable figure. This is doubly impressive for a guy whose acting (despite the lessons) is universally considered wooden. But somehow, Norris went on to even greater success with his Walker, Texas Ranger TV series, which ran for 8 years, and no doubt contributed greatly to his estimated net worth of $70 million. Perhaps born from resentment of Norris’ success, a website called Chuck Norris Facts, which is actually just a collection of sarcastic jokes, gained widespread popularity. Norris went along with it for a while, claiming to enjoy the humor, but it finally annoyed him to the point that he filed a lawsuit. This occurred after a book titled “The Truth About Chuck Norris: 400 facts about the World’s Greatest Human” was published. Norris eventually dropped the suit. Fortunately, two new martial artists emerged in the late eighties, and both were better actors than Norris. These men were Jean-Claude Van Damn, and Steven Seagal. I will post reviews on both, starting with Seagal. Dan Reno happens to enjoy Seagal’s films. His favorite is Marked for Death, where Seagal does battle with a gang of ruthless Jamaican drug dealers. 3 Responses to The martial artist movie star – it all started with Bruce Lee. Do you know if Bruce Lee appeared at SJSU? Do you know someone who might know. Thanks you for any information. Thanks, Dave Stanton. That’s more than we knew before! Appreciate the response.